A luxurious, custom home on a 1-acre home site surrounded by other equally magnificent homes ranging from 7,000 to 15,000 square feet with tranquil, golf course and water viewsâthis is an extraordinary find. Add the incredible Old Palm Golf Club lifestyle and amenities, and now weâre in rarefied territory. If you or a close friend is looking for a true private club experience surrounded by the natural beauty of Florida, look no further than the Custom Estates at Old Palm Golf Club in Palm Beach Gardens, where there are still limited opportunities to build the custom home of your dreams. The cul-de-sac lot at 12409 Hautree Court offers southern views over both golf course and lake. While the vistas are stunning, they are also discreet with native plantings, forested areas and landscaping judiciously placed to ensure privacy. Choose from Old Palmâs list of approved independent luxury builders to design and build your new Florida luxury golf course estate. The price for this ready-to-build lot is $2,875,000. On another cul-de-sac, overlooking golf course and water, sits another large home site at 11758 Elina Court. This desirable lot is also available for you and your approved custom independent builder to establish a residence of distinction. The price for this ready-to-build lot is $2,200,000. Another available Custom Estates home site is located at 12216 Tillinghast Circle. 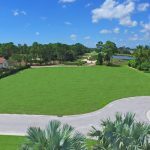 Hasey Construction, Inc. recently broke ground on this 1-acre lot for a fabulous six bedroom model home that will look directly across wide water to the 10th and 11th greens. The planned home features over 8,500 square feet of living area, a six car garage and resort-style pool and patio areas with summer kitchen. The floor plan envisages a palatial master suite including a sitting area and dual master baths. Hasey Construction, known for unique home designs, combined both form and function with this plan. There is still time to work with the architectural team to make this home your personal statement of design and taste. The price for the lot and home is $7,900,000. Old Palm Golf Club has a well-deserved reputation as one of the finest golf clubs in the country, offering limited membership and no tee times on a par 72 Championship golf course designed by Raymond Floyd. Residents of Old Palm enjoy privacy in this beautiful setting, impeccable service at every level and a welcoming community of neighbors. The gated golf clubâs Palm Beach Gardens location offers easy access to beaches, the Palm Beach International Airport and favorite cultural venues such as the Flagler Museum, The Norton and The Kravis Center for the performing artsâas well as dozens of social events and opportunities within the club just in case you never want to leave.